I am so excited to share with you an amazing book I just read! 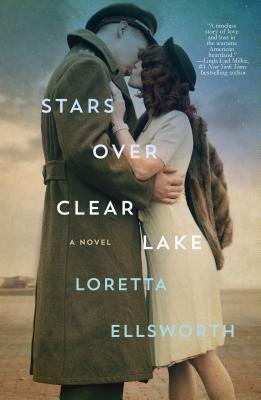 Stars Over Clear Lake is written by an award-winning author, Loretta Ellsworth, who is best known for penning compelling, unique characters who undertake journeys of self-discovery. Her first four novels have been for young adults but her debut adult novel, STARS OVER CLEAR LAKE, is an historical-commercial women’s fiction novel that launched May 2 with St. Martin’s/Thomas Dunne Books. Set during the 1940s and the present and inspired by the historic Surf Ballroom near Mason City, Iowa, where Loretta grew up, STARS OVER CLEAR LAKE is a moving story of forbidden love, lost love, everlasting love―and self-love. For the first time in decades, Lorraine Kindred has returned to the ballroom where she was swept away by the big bands during the 1940s―and by a star-crossed romance. As she takes in the magnificent energy and brassy sounds of her youth, the past comes to life, along with the fateful decision all those years ago that forced her to choose between personal conviction and social expectation, between the two men who had captured her heart. It had been a time of great music and love, but also of war and sacrifice, and now, trying to make peace with her memories, Lorraine must find the courage to face buried secrets. In the process, she will rediscover herself, her passion, and her capacity for resilience. Not only is she an amazing author but she is also a local author to me! Loretta, who lives in Lakeville, Minnesota (only about 10 minutes from me! ), is a graduate of Hamline University and the author of THE SHROUDING WOMAN, a Rebecca Caudill nominee; IN SEARCH OF MOCKINGBIRD, which won the Midwest Bookseller's Choice Honor Award, was a Teen's Top Ten finalist, was an IRA Notable, and was named to the New York Library's List of Books for the Teen Age; IN A HEARTBEAT, which was named a spring Midwest Connection's Pick and an ALA Notable; and her most recent book, UNFORGETTABLE, which is a Kirkus Pick of the Month. I love, love, LOVE WWII historical fiction novels so this book was so intriguing to me! I am so glad I gave it a chance because Stars over Clear Lake was a unique, well-written and very interesting book! I love that it gave history of ballrooms and prisoner camps back in the 1940s - that was so interesting to me! The history I learned in this book is phenomenal! The storyline was also so easy to read and easy to love! I fell in love with this book and the characters from the first pages and couldn't put it down! I will be sharing this book with everyone I know and you must read if you love historical fiction books!